A brief description of the special multi-volume datasets used as a reference for the program @SSwarper, which both skull-strips and generates a nonlinear warp to a reference template space. For full details on this program, as well as how to integrate it straightforwardly with afni_proc.py, please see @SSwarper’s helpfile. In short, this program iterates internally between skull-stripping and registration to a reference template brain to accomplish the dual goals of skull-stripping the input and estimating a nonlinear warp to a standard template space; these problems are not independent, and this program leverages that fact to provide reasonable results for both quite often. While the final level of refinement (i.e., the patch size checked for alignment) can be selected by the user, in general @SSwarper can be pretty slow overall, of the order of a couple hours. However, the biggest time-hog within it (3dQwarp) has been written using OpenMP, so it can run on several CPUs simultaneously, saving time. If you have the computer space, using something like 8-12 CPUs should provide good speed up, greatly reducing the overall run time. Fancy-schmancy JPG image files showing the alignment of the features of the data sets, namely an edge-ified version of one over the other (this facilitates the quality check of the alignment and skull-stripping– don’t forget to look at your analyzed data!!). 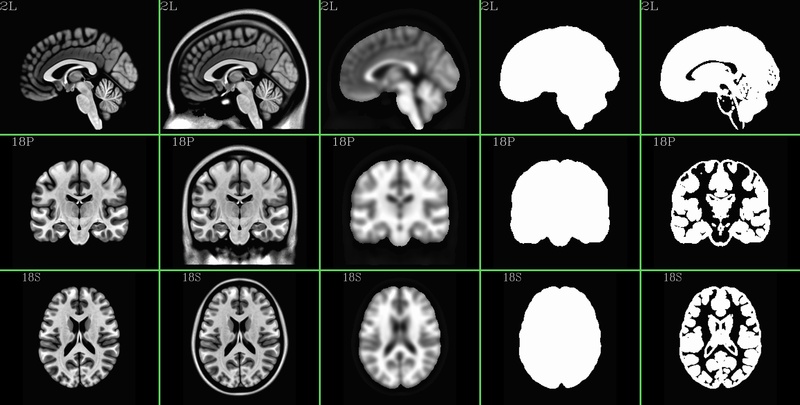 your EPI brain coverage (see program 3dmask_tool). The above sub-volumes need to be present in the -base .. dataset for @SSwarper, in the correct order. You are welcome to make your own. Commented scripts are provided below for demonstrating how some of the above examples were made, to give you some help along the way. Here are some example scripts for making each of the five volumes of the TT_N27_SSW.nii.gz dset (do_TT_0[0-4]_*tcsh) and then for concatenating them all (do_TT_05_*tcsh). Each script is commented. Note that the making of the “skull-on”  volume is a bit of a special case here for TT_N27_SSW.nii.gz: the version of this brain with a skull on was not in the same space as the skull-stripped  volume, and therefore it had to be brought into it using parameters stored in the header file using “adwarp”. For most scenarios, this step would not need to be done as such (it would usually just be copied, for example). do_TT_00_brick_SKoff_cp.tcsh Make the “skullstripped”  volume. Basically, just copies a skull-stripped reference volume. do_TT_01_brick_SKon_adwarp.tcsh Make the “skull-on”  volume. See the text above for why this is such an unusually involved step here. do_TT_02_brick_SKweight_blurinmask.tcsh Make the blurry volume that includes a dimmed skull, as the  volume. This is done by using the already-made volumes  and . do_TT_03_brick_Bmask_wbmask.tcsh Make the whole brain mask  volume. do_TT_04_brick_GCmask_gminfl.tcsh Make the (inflated, or “generous”) gray matter tissue mask  volume. do_TT_05_combo_scale.tcsh Concatenate all the individual bricks into a single, multi-volume masterpiece. Here are some example scripts for making each of the five volumes of the HaskinsPeds_NL_template1.0_SSW.nii.gz dset (do_HP_0[0-4]_*tcsh) and then for concatenating them all (do_HP_05_*tcsh). Each script is commented. Also, the final volume’s inflated gray matter (GM) map in volume  was made starting from the HP template’s associated atlas (“HaskinsPeds_NL_atlas1.0+tlrc”). do_HP_00_brick_SKoff_cp.tcsh Make the “skullstripped”  volume. Basically, just copies a skull-stripped reference volume. do_HP_01_brick_SKon_borrowskull.tcsh Make the “skull-on”  volume. See the text above for why this is such an unusually involved step here. do_HP_02_brick_SKweight_blurinmask.tcsh Make the blurry volume that includes a dimmed skull, as the  volume. This is done by using the already-made volumes  and . do_HP_03_brick_Bmask_wbmask.tcsh Make the whole brain mask  volume. 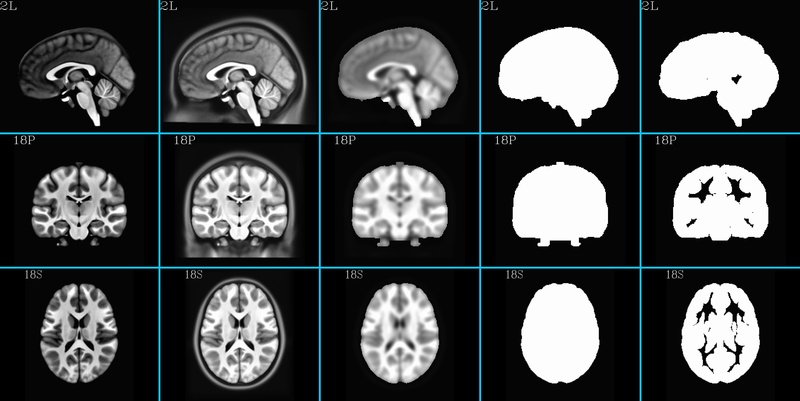 do_HP_04_brick_GCmask_gminfl.tcsh Make the (inflated, or “generous”) gray matter tissue mask  volume; uses the associated atlas to define a GM map, which gets inflated. do_HP_05_combo_scale.tcsh Concatenate all the individual bricks into a single, multi-volume masterpiece.